The newly constructed Levi's Stadium officially opened on July 17, 2014. It is located in Santa Clara, California, 38.3 miles south of San Francisco. On June 8, 2010, voters in Santa Clara approved Measure J, allowing Santa Clara to lease the land previously being used as an overflow parking lot by the Great America theme park. This allowed the 49ers Stadium Authority to begin plans to construct Levi's Stadium for the San Francisco 49ers. Funds for the project were secured on December 13, 2011 and construction began in April of 2012. 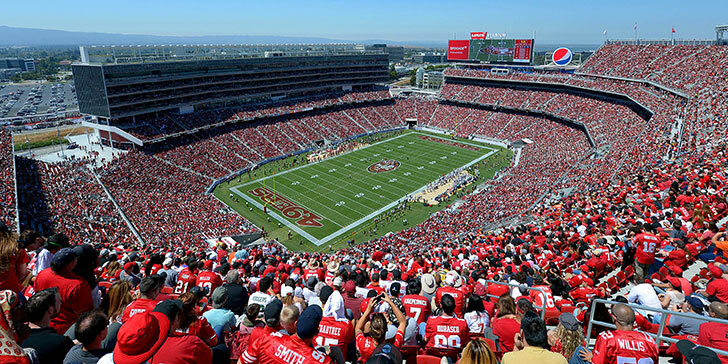 Santa Clara was chosen after plans to build a new stadium at Candlestick Point, an effort to replace the aging and outdated Candlestick Park, failed when the 49ers and the city of San Francisco could not come to an agreement on the new stadium's location. The 49ers offices and training facility have been located in Santa Clara since 1987, so that was the logical next choice. Tip: August through October can be very warm. Dress accordingly, use sunscreen, and make sure you drink plenty of water. Levi's Stadium and the San Francisco Bay Area were chosen as the host stadium and city for Super Bowl 50, which took place on February 7, 2016. On May 9, 2013, the 49ers and Levi Strauss & Co. announced a 20-year naming rights proposal to the Santa Clara Stadium Authority. The deal is worth $220 million, making Levi Strauss & Co. a corporate sponsor of the 49ers. At the time, the $11 million per season deal was the second largest among current NFL naming rights agreements. 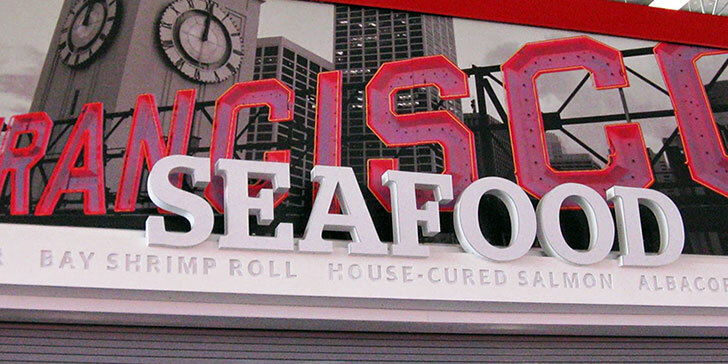 Over 180 different food items are served at Levi's Stadium, with 17 types of quick-service concepts that are named for exactly what they're selling. They include Franks (nitrate-free, with a vegan option), Burgers (with American Kobe beef and vegan burgers), Curry (Indian-style, with spiced naan, cassava chips, and varieties like Rajisthani lamb and vegan navy bean and kale), Tortas, Soft Serve, Barbecue (pulled pork or pulled jackfruit), Panini and Steamed Buns (Asian-style bao in Peking duck, pork belly, and vegan portobello varieties). There are also kid's meals at meny stands with choices like pizza, hot dogs, and chicken tenders. Vegans and vegetarians also have plenty of options available. On the upper concourse, there is a Mondo Burrito, a tap room with 42 different draft beers, and many places have wine available. There is also Michael Mina's Bourbon Steak & Pub, a high-end steakhouse with a casual pub that is also open on non-game days. Of course, if you are a member of the press, you are provided three meals on game days within the Verizon Press Level. 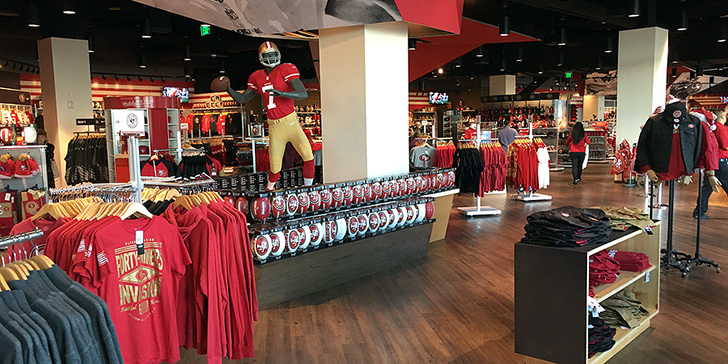 The San Francisco 49ers' flagship team store is located inside Intel Gate A at Levi's Stadium. The year-round store exists in a 13,000 square foot area and feature officially licensed team merchandise. There are also numerous smaller stores and kiosks located throughout the stadium. You can also purchase merchandise from the San Francisco 49ers Official Online Store. Tip: While the Levi's Stadium store offers a larger selection than the official online store, much of the inventory is available there. If you see something that you like at the Levi's Stadium store, check for it online. You will likely find it cheaper and it will be delivered to your home. 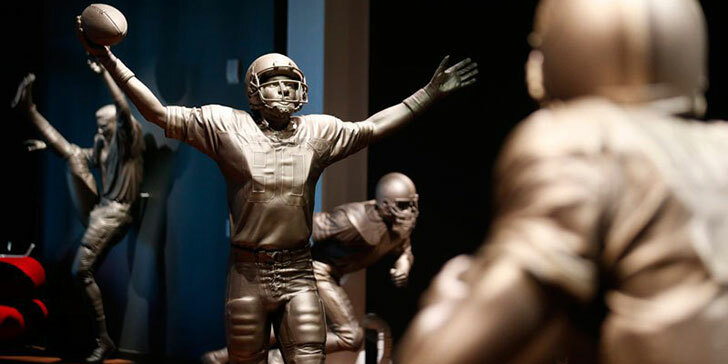 Levi's Stadium is home to a 20,000 square-foot interactive museum that highlights the San Francisco 49ers' rich history in the Bay Area and consists of 11 gallery and exhibit spaces. You can stop by the Morabito Theater to watch the history of the 49ers on a 50-by-18 foot Sony 4k screen. The Edward J. DeBartolo Sr. 49ers Hall of Fame houses life size statues of the 49ers' enshrined in Canton, Ohio. You can even see a re-creation of legendary 49ers head coach Bill Walsh's first office located in Redwood City. There is a learning center for younger fans and interactive features on the bottom level of the museum. For example, you can practice your field goal skills by kicking through a virtual field goal, practice your endzone dance, learn to cheer with the Gold Rush cheerleaders, try your hand at broadcasting, and try on a 49ers uniform. There is stadium wide Wi-Fi available for all fans. You can use it to access statistics, replays and more via the stadium's official app. You can also place an order for food from your seat and either pick it up or have it delivered to you for a small fee. The options available for in-seat delivery are limited. You place an order and pay on your mobile device, an estimate for the delivery time is given, a code is made available on your device, and you show that code to the person that delivers your order. Tip: Allow more time than the given estimate for your order to be delivered. The estimate can be lower than the actual delivery time. You also have access to mobile ticketing, access turn-by-turn directions throughout the stadium, and view wait times for concession stands and restrooms. It is estimated that, while within the stadium, fans are never more than 10 feet away from a Wi-Fi signal. Data speeds within the stadium during game time average about 60 Mbps for both download and upload. Tip: It is important to note that some phone carriers may be able to beat those speeds in the area of the stadium. For example, T-Mobile gets around 80 Mbps download in the area. Game time speeds will vary. Levi's Stadium features 49 solar arrays provided by NRG Energy on the roof of the facility to form the NRG Solar Terrance. It also features NRG Solar Bridges that fans cross to access the stadium. These all consist of over 1,150 solar panels. They gather enough energy to power the stadium for every San Francisco 49ers home game. 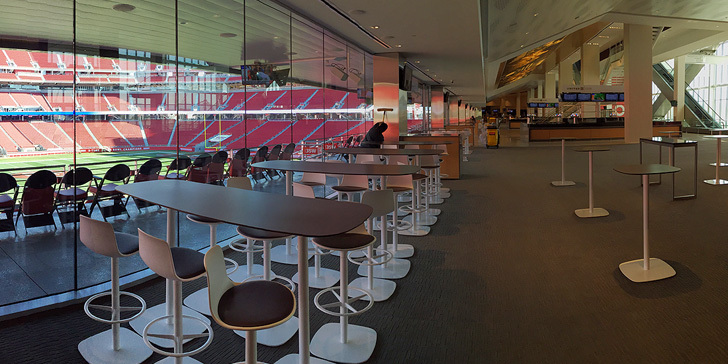 There are 10 clubs located within Levi's Stadium, with the largest being the United Club located on the 300 level of the Suite Tower. It runs the entire length of the field. The first pro sports event at Levi's Stadium was an MLS game between the San Jose Earthquakes and the Seattle Sounders on August 2, 2014. Levi's Stadium is located 38.3 miles south of San Francisco. That is the farthest distance of any NFL stadium from its team's home city. On a clear day, you can see downtown San Francisco from the NRG Solar Terrance. Levi's Stadium is the home of college football's annual Fight Hunger Bowl. Levi's Stadium's official groundbreaking took place on April 19, 2012. Levi's Stadium's first steel beams were laid down on July 30, 2012. Levi's Stadium's first seats were installed on October 1, 2013. Levi's Stadium hosted Super Bowl 50 on February 7, 2016. Levi's Stadium was the first NFL stadium to open with LEED Gold certification. Levi's Stadium offers family restrooms for parents and their small children. Like the other restrooms in the stadium, there can be a wait time for access. The stadium can be loud for smaller children, especially during player introductions. You may consider bringing baby and infant ear muffs. While the list of things that cannot be brought into the stadium is long and you can't bring in larger bags that aren't clear, diaper bags are allowed. Tip: While the inner concourse is often crowded during games, the outer concourse is not. If needed, walk there to get around the stadium. Levi's Stadium has nine levels. Some of those levels, such as the Verizon Press Level, are not accessible by fans. Level 2 is the level that sits at street level. Below is a list of the different levels. Below are some links to hotels near the stadium and ordered by distance. These are just for reference and are not an endorsement by this site. The hotels listed below are just minutes from the stadium, with the first two being a short walk away. Tip: Are you planning a trip to Santa Clara for a game? Stay at one of the hotels within a short walking distance of the stadium rather than one further away. For example, the Hyatt Regency Santa Clara and Hilton Santa Clara are very close to the stadium offering an easy walk on game days and you won't have to worry about parking. Levi's Stadium has excellent transit access including buses, VTA light rail, ACE trains, Capitol Corridor, and Caltrain that drop fans off within an easy walking distance to the stadium. Tip: If you took a train to the game, allow time to wait in line when leaving the stadium. There are numerous parking lots available for San Francisco 49ers games. However, a number of them are a good distance from the stadium itself. Use of public transportation is encouraged. Tailgating and open flame cooking is limited to specific parking lots. Check the Levi's Stadium Tailgate Map for more details. Tip: While parking passes for Levi's Stadium are expensive, there are some local restaurants that offer parking passes when you eat there. For example, Mikayla's Restaurant just down the street from Levi's Stadium offers an "Eat Here on Game Day & Park Free" pass. Take the 101 south to the 237 east. Exit Great America Parkway toward Lafayette St. Keep right at the fork, follow signs for Great America Pkwy and merge onto Great America Pkwy. Turn left onto Tasman Dr.
Take the 880 south to the 237 west. Exit Great America Parkway toward Lafayette St. Turn left onto Great America Pkwy. Turn left onto Tasman Dr.
Take the 101 north. Exit Great America Parkway toward Bowers Avenue. Turn right onto Great America Pkwy. Turn right onto Tasman Dr.
Tours of Levi's Stadium are available on most days when there is not a home game. The tours walk fans through the Verizon Press Level, club suites, NRG Solar Terrance, and other areas of the stadium that may not normally be accessible to fans.